As a not-for-profit public utility, the Kansas City Board of Public Utilities (BPU) has provided safe, dependable water and electric services in Kansas City, Kansas, for more than 100 years. Today, BPU services 65,000 electric customers and 51,000 water customers, over approximately a 130 square mile area. BPU’s primary focus has always been, and remains, the satisfaction of its customers and a commitment to the quality of life in the communities it serves. 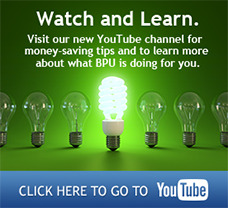 This has allowed BPU to be recognized as one of the top public utilities in the country. The administrative offices and customer service lobby of the Kansas City Board of Public Utilities will be closed on Friday, April 19, 2019. The Certificate of Achievement for Excellence in Financial Reporting has been once again awarded to the Kansas City Board of Public Utilities (BPU) by the Government Finance Officers Association of the United States and Canada.